Man is an aerial acrobat on belts, he stands high in the sky. 4k00:23Healthy, young beautiful woman doing exercises for oblique abdominal press muscles,, on the beach, at sunrise, Makes exercises for balance and coordination, deep muscle tone. hd00:12Male aerial acrobat shows tricks on canvases in the sky. hd00:25Crane lifts the gymnast's man into the sky. hd00:20Male aerial gymnast shows a show in the sky. hd00:30Man on the ring does gymnastic exercises high in the sky. hd00:15Male athlete is an athlete who is tall, he performs tricks on the ring. hd00:30Athletics at the height in the sky, the man on the ring. hd00:28Male aerial acrobat shows tricks in the sky. 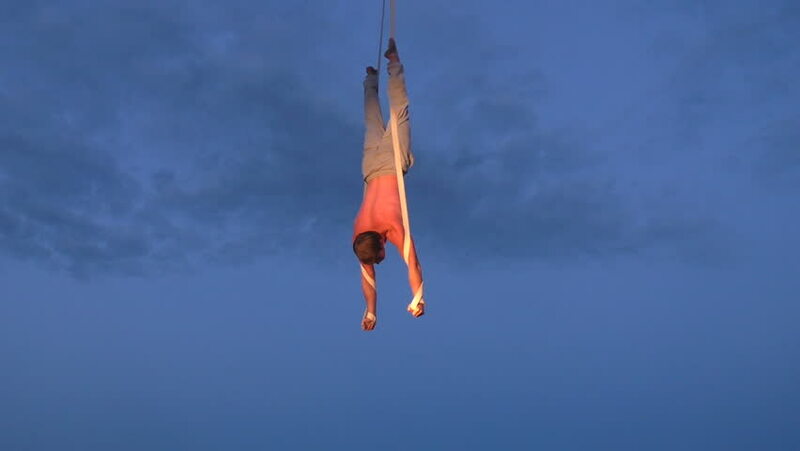 hd00:24Man is an aerial acrobat on the straps, he performs tricks in the night sky.